Full time maid. Mobile phone with local number provided. Well secluded at the end of a very calm alley, villa Thiara is yet perfectly located in the heart of Oberoi area in Seminyak. 500m away from the Kudeta beach, the famous Beach Club where we can enjoy the splendid sunsets, this villa is also a stone’s throw away from many great restaurants and high end boutiques. After passing through the beautiful antique door as you enter the villa, you will find the 13 meters long swimming pool, where you can enjoy plunging yourself in a blue clear water on the morning before having the delightful breakfast. 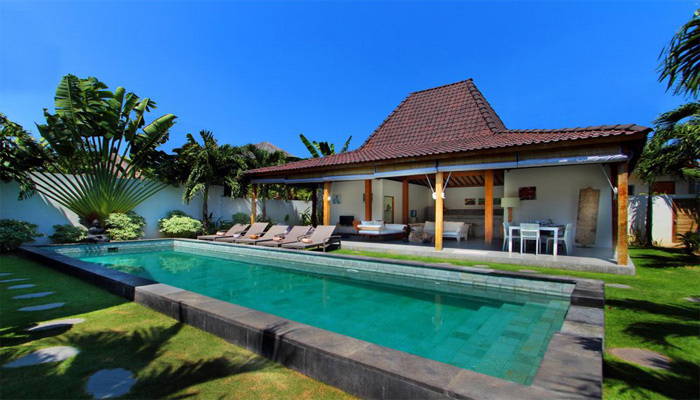 Two lovely bungalows with alang-alang roofing (typical Balinese thatch) are placed at the end of the pool. 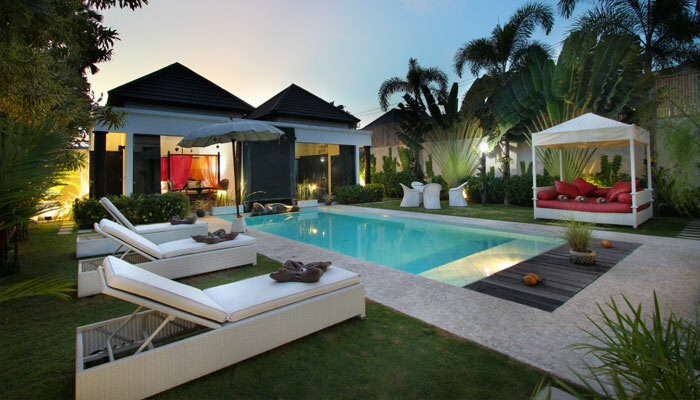 You will find in each one, a nicely decorated bedroom offering a pool view with en suite bathroom. The main building is in a Joglo concept (Indonesian traditional house in old teak), the solid structure by centenary wood material that shelters the living room, TV area, the open-plan kitchen with the dining room. This spacious place offers a friendly ambience in a sophisticated decoration. 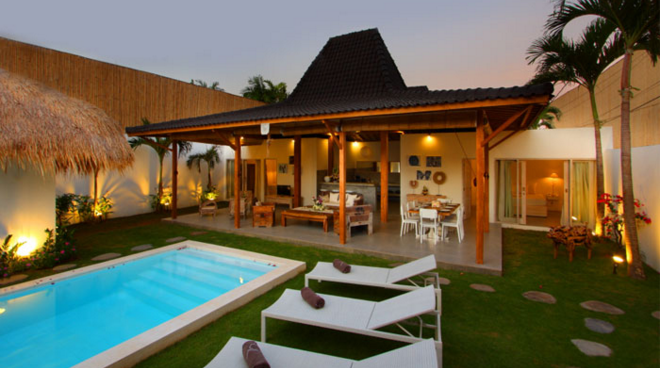 Opened on three sides, you will enjoy a better view of the luxuriant tropical garden. In each side of the house, two modern and cozy bedrooms are accessible through their bay windows giving a garden view. Moreover, both bedrooms are equipped with a spacious dressing area, large mirror and en-suite bathrooms at your disposal. Great place, amazing staff. The rooms were spacious and spotless, the pool a good size and there was plenty of room around the pool to sunbathe. Fantastic location can pretty much walk to everything you need. easy walking distance to the beach, shops, and restaurants. Would stay here again. You have review for Villa thiara?